“A large, fat, greedy baby with a shock of unruly black hair, and huge grey astonishing eyes”. 21 October 1772, birth of Samuel Taylor Coleridge!! So, that makes today the 240th anniversary of Samuel Taylor Coleridge’s birth! 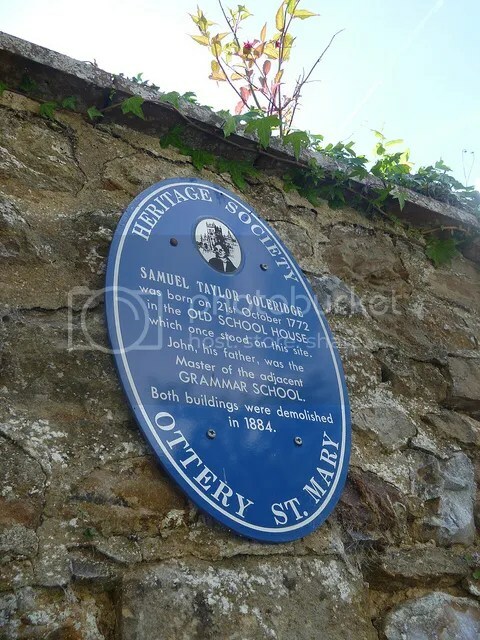 Coleridge’s birthhouse hasn’t survived the tide of time, but a nice plaque has been put near the original site to commemorate the birthplace of what might just be Ottery St Mary’s most famous son. Thanks to flickr user Woolmark for the nice photo.